Limbers up by typing “Quetzalcoatl” over and over again. Turns the last page of Bird by Bird, then throws the book against the wall. Mickey, his editor, hands him How Fiction Works and restarts the stopwatch. Sets type on a letterpress to get a feel for the sculptural qualities of his paragraphs and for strength training. Wrestles with his muse, a 140-pound bullmastiff named Butkus. Punches a boxing bag with Emily Dickinson’s face on it. Pounds a quart of whiskey, finishing it off with a pack of cigarettes. Slaps a wrist wrest down, goes a few rounds on his lit blog. Jogs through the Italian market, stopping to drop a pile of rejection letters into a burning trashcan. Runs up art museum steps, hurls copyedited manuscript into the air, frame freezes. Marco Kaye is a writer in Portland, Oregon. 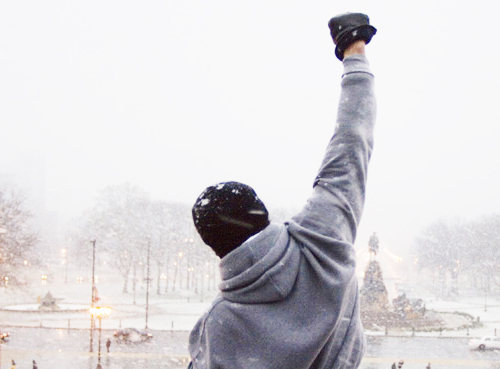 He saw the movie Rocky for the first time recently, somehow escaping it for 28 years. Also, he has never played the board game Monopoly. Appendix A: The Problematic Raptor Q. & A. The first fact is something most people don't know. The second fact states the obvious, which should amuse you. In which we pretend to care who's playing.